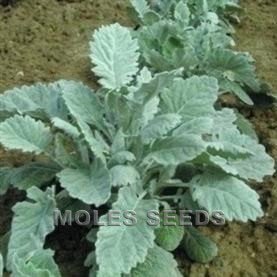 Dwarf variety with rounded silver leaves, very weather resistant. 20cm. Greenhouse biennial. Sow on compost surface, keep moist, takes 14-21 days at 20°C. Protect from direct sunlight. Prick out into cell trays or small (7cm) pots when large enough to handle. Then into 10-11cm pots, grow cool and airy at approx. 10°C, do not overwater, and use a liquid feed once plants have rooted to the base of the pot to ensure good leaf cover, market when flowers are half open. Sow July, flower late Dec-Jan. Sow August, flower February. Sow Sept, flower March. Sow Oct, flower April-May. 4000 seeds per gram (sow 1/2g for 1,000 plants). End Use: Indoor pot plant. Annual, sow February-March, or July for production of plants for Winter containers. Germination takes up to 21 days at 18-21°C, cover lightly with vermiculite, prick out after 5-6 weeks and grow on at 10-15°C. Ready in about 12 weeks from sowing. 2,500 seeds per gram (sow 1g for 1,000 plants). Sell in: 6- or 9-packs (Silverdust). End Use: Silver-leaved contrast plant in formal bedding schemes, and mixed baskets and containers.